Android coffee table developed by Ideum and 3M | What Hi-Fi? Tablets and smartphones are what usually come to mind when we learn about the unveiling of a new Android-enabled device. But now a collaboration between Ideum and 3M has thrown up something a little less ordinary. Engineers from the two American firms have worked together to develop a high-performance Android OS solution for large-format, multi-touch devices. And Ideum's Platform 46 Coffee Table is the first example. At this year's International Consumer Electronics Show (CES), we saw how Android would be coming to a Philips TV near you in 2014. It seems Ideum believes there is a market for more Android solutions in your living room. The Platform 46 Coffee Table features a 46in, multi-touch screen previewing a range of Android apps – including those already available on mobile devices – at the Digital Signage Expo in Singapore this week. 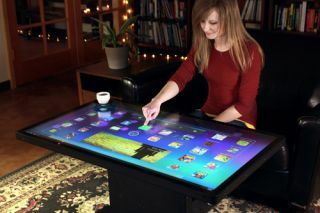 The table runs Android 4.1 (Jelly Bean) and has a bezel-free, full HD 1080p LCD display from 3M. It is set to go on sale later this summer and Ideum is promising more Android products, like dual-boot Android and Windows 8 system. A 32in table is also available. It is thought the development of the Android-powered tables will give developers in key markets – like gaming and entertainment – an opportunity to create large-format, multi-user applications that provide new solutions for customers. Ideum CEO Jim Spadaccini said: "We think developers will be excited about the ease of authoring on the popular Android platform and the amazingly fast performance on our tables. "Native Android OS support expands the possibilities for our multi-touch tables giving developers new options and providing end customers new and dynamic software solutions." You can already purchase a Windows 8-powered coffee table from Ideum, which costs from US$6950 and also boasts a range of connectivity options including ethernet, wi-fi, USB, HDMI and Bluetooth. Ideum has also recently announced that its 55in and 65in multi-touch tables and touch walls are now available in 4K Ultra HD versions, while the 100in Pano multi-touch table comes with dual 4K Ultra HD monitors.